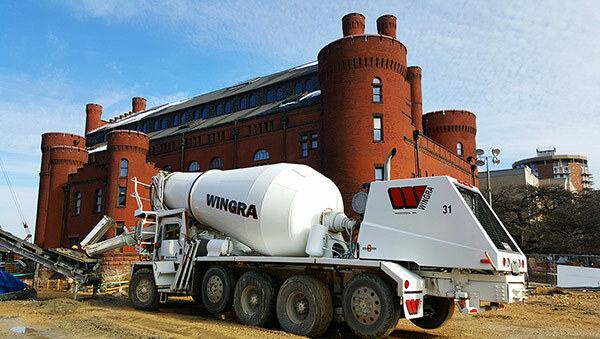 Wingra Redi-Mix produces hundreds of different mixtures to meet your project’s needs. These mixtures are produced by fully computerized state of the art batching plants assuring accurate and uniform mixtures. We produce and control our own aggregates, this provides for a higher quality concrete product. Our product is continuously checked in the field by quality control personnel. We have participated in the largest of commercial projects in the Madison area including the Monona Terrace Convention Center, Kohl Center and Overture Arts Center. These projects required state of the art high strength and other special mixes engineered to meet the strictest of project specifications. Our production facilities, locations, and fleet allow us to be the supplier of choice on these large commercial projects. Residential construction is an important part of our concrete business. 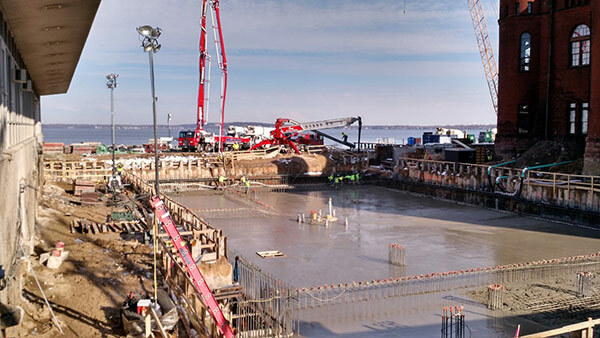 An average size home will use anywhere from 75-150 cubic yards of concrete. This includes the foundation walls, basement floors, stoops, steps, sidewalks and driveway. The remarkably long lasting quality of concrete makes it the best choice for your housing construction material. Portland cement concrete is a simple material in appearance with a very complex internal nature. In contrast to its internal complexity, concrete’s versatility, durability and economy have made it the world’s most used construction material. This can be seen from its variety of uses from highways, bridges, buildings, and homes to floors, sidewalks, patios and pools. 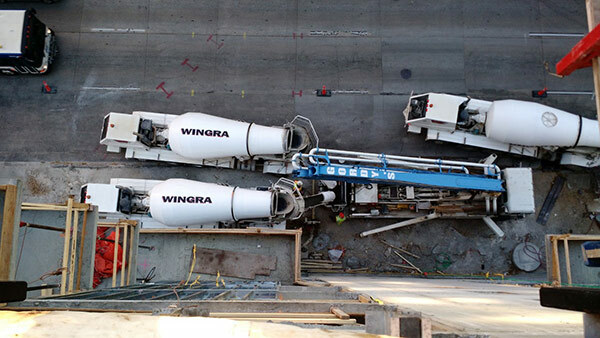 Concrete is basically a mixture of two components aggregates and paste. The paste, comprised of portland cement and water, binds the aggregate (sand and gravel or crushed stone) into a rock like mass as the paste hardens because of the chemical reaction of the cement and water. Aggregates are generally divided into two groups: fine and course. Fine aggregates consist of natural or manufactured sand while the course aggregates consists of larger stones. Since the aggregate make up about 60% to 70% of the total volume of concrete their selection is important. 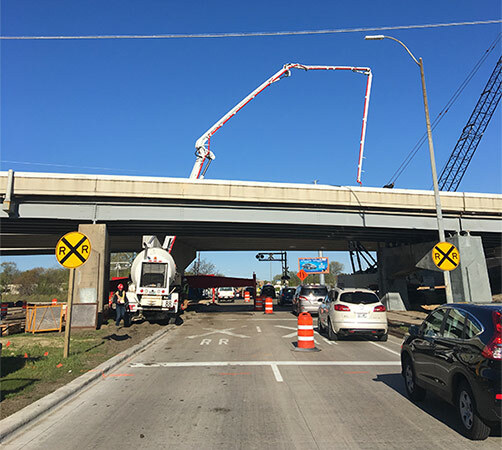 Aggregates should consist of particles with adequate strength and resistance to exposure conditions and should not contain materials that will cause deterioration of the concrete. For any particular set of materials and conditions the quality of hardened concrete is determined by the amount of water used in relation to the amount of cement. The less water used, the better the quality of the concrete provided it can be consolidated properly. Some advantages of reducing water content are increased strength, lower permeability, increased resistance to weathering and reduced shrinkage. 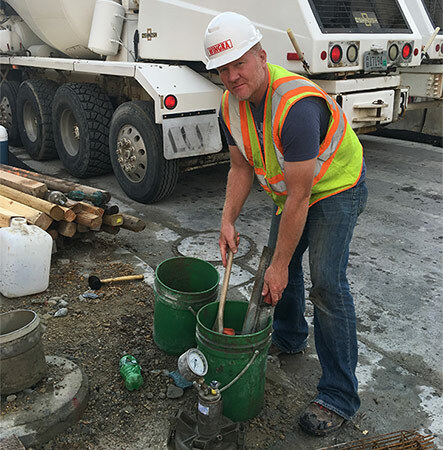 The freshly mixed (plastic), and hardened properties of concrete may be changed by adding, admixtures to the concrete, usually in liquid form during batching. Admixtures, are commonly used to adjust setting time, reduce the water demand, increase workability, intentionally entrain air and adjust other properties. After completion of proper proportioning, batching, mixing, placing, consolidating, finishing and curing, hardened concrete becomes a strong, noncombustible, durable, abrasion- resistant, and practically impermeable building material that requires little or no maintenance. Concrete is also an excellent building material because it can be formed into a variety of shapes, colors, and textures for use in an almost unlimited number of uses.